It’s been a while since I posted about the blue and yellow blocks in my header–my December 31, 2010 post to be exact 🙂 Jules was still here when I started it in Panama and he gave it a Spanish name–Cielo Azul–meaning Blue Sky. I recently decided to get it out of the drawer to see where I left off when I got disgusted with it. My disgust resulted from a math error (I multiplied 8 x 4=48 instead of 32–now that is embarrassing!) which caused me to over-cut my diamonds by 16 blocks. I found I had stitched and pressed 57 blocks (above photo shows 60) and had 11 more cut so I decided to keep going for a bigger quilt. I just needed to cut 8 half-hex blocks and decide what to do about the irregular sides. 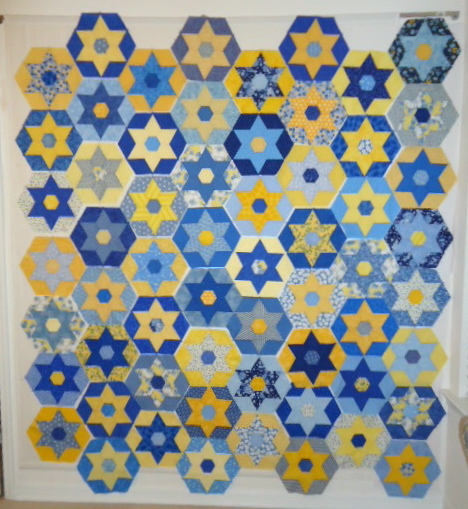 When I finished sewing the blocks, it didn’t even fit on my design wall so I had to overlap and pin the far left column. More on deciding about the irregular edges later. I’m not certain if this photo was my final configuration. Some of the blocks are off the wall now as I have started sewing columns together and then joining them with a long zig-zag seam that takes several evenings. I plan to make three sections of three columns each. That way, I will only have to deal with a large amount of fabric in my lap for the last two seam joins. 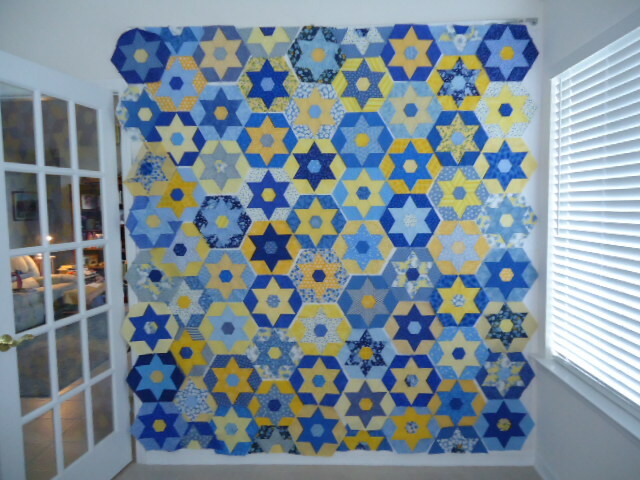 This entry was posted in hand piecing, hexagons, quilting and tagged hand piecing, hexagons, quilting. Bookmark the permalink. Thanks for admitting to simple errors – I find that very comforting. And this quilt is beautiful. Very beautiful. Love blue and yellow together. We have all made those silly math mistakes. Good thing we can laugh about them. I sometimes think I am the queen of math mistakes! I usually use a calculator for EVERYTHING! Haha. Even the simple stuff. The good thing is, that your quilt looks wonderful! You are going to have quite the job piecing it together, but it is well worth the wrestling! What a beautiful quilt, Carol. I bet it’s very happy to be out of the drawer and back in production. Better to overcut than undercut! Looking forward to seeing more of your work-in-progress. It is indeed a starry sky! It’s beautiful. Arthur says it looks hard!